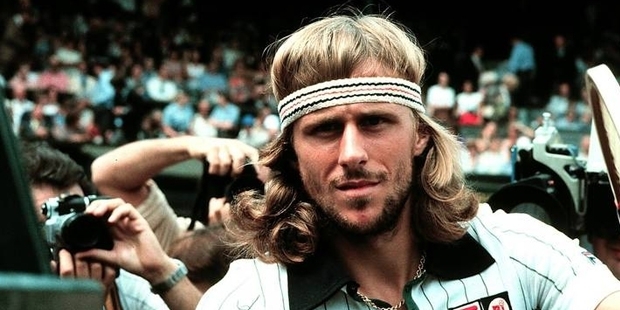 Bjorn Borg is a Swedish tennis player, considered to be one of the greatest tennis players of the Open era. He has won a total of 11 Grand Slam titles between 1974 and 1981. His was the first player to win 10 Grand Slams in the Open Era. He has won 5 consecutive titles at Wimbledon and 6 titles at the French Open. His winning percentage over all surfaces (clay, grass, hard and carpet) stand at 82.72% with a total of 608 wins and 127 losses. He is the first player to win more than a million dollars in a single calendar year, that too in 1979 itself. Bjorn ‘Rune’ Borg was born on June 6, 1956 at Stockholm, Sweden. He started playing tennis with a tennis racquet that his father received as a present. He was quick to catch up on the strokes and by the age of 13 he was playing against the best U-18 players in Sweden. He was able to beat experienced players who were more than 6-7 years older than him. He entered the professional circuit at the age of 14 itself. In 1972, he became the youngest player to represent his country at the age of 15 only. He also went on to win his first singles match in the Davis Cup by beating experienced professional Onny Parun of New Zealand. Bjorn had become the athlete to watch out in his country Sweden. There was always attention given to him in the national newspapers and television. In 1972, he also went on win the Junior Wimbledon. In 1973, Borg played in the Wimbledon main draw at the age of 16 itself and was able to reach the quarterfinals. A 16 year old reaching the top 8 of the most competitive tennis tournament in the world was international front page news. In 1974, he went on to win his first singles title, by becoming the youngest winner of the Italian Open. That year he again made international headlines, when he beat Manuel Orantes in the French Open final to become its youngest winner. In 1975, Borg captured the French Open title for the second time and also led his country to the Davis Cup by winning two singles and one doubles match to beat Czechoslovakia 3-2 in the final rubber. In 1976, he won Wimbledon without losing a set in the whole tournament becoming the youngest male champion at age of only 20. In 1976 French Open, Borg lost to Adriano Panatta who had also defeated him in 1973. At the end of his career, he would be the only player to defeat him at the French Open. From 1977 to 1980 were the best years in Borg’s career. He went on to win the French Open and Wimbledon double from 1978-1980. He participated in the Australian Open only once and came into the finals of the U.S. Open in 1976, 1978, 1980 and 1981. He retired from the sport of tennis at the age of 26 only which came as a shock to the sporting fraternity. His consecutive titles at Wimbledon from 1976-1980 and his back to back titles at the French Open from 1978-1981 are his greatest achievements. He has also the record of 33 singles victories at the Davis Cup which still stands today. We do not know how many more Grand Slams he would have won if he did not retire at such a young age. He went on to win 11 of the 27 Grand Slam tournaments he has entered in. His winning percentage stands close to 89% in Gland Slam tournaments and 92% at Wimbledon. He was the ATP Player of the Year from 1976-1980. He is by far the most dominating and successful athlete of the modern era.